How much does art and culture contribute to economic growth? Image: Visitors walk behind a work by British artist Damien Hirst titled "The Physical Impossibility of Death in the Mind of Someone Living". REUTERS/Miro Kuzmanovic. There is growing international interest in the potential of the cultural and creative industries to drive sustainable development and create inclusive job opportunities. An indication of this is a recent set of UNESCO guidelines on how to measure and compile statistics about the economic contribution of the cultural industries. But should this be the only reason for funding arts and culture? Cultural industries can be defined as those whose major outputs have some symbolic value – such as fine arts, film and craft – but also possibly including jewellery design, publishing and fashion. Creative industries are defined more broadly. These have knowledge as their major input, and in addition to cultural goods and services could include things like software design and internet services. UNESCO has provided guidelines on ways in which these industries can be classified. But there is still no international consensus. Nor is there likely to be, since different countries will have very different levels of involvement and focus that may shape what information is useful for them. Cultural Times, the first global map of the cultural and creative industries, which was recently released, acknowledges the societal value of arts and culture. Undeniably, culture and creativity have been the cement that binds together not only hearts and souls, but entire societies and nations. This survey quantifies the global economic and social contribution of the sector. 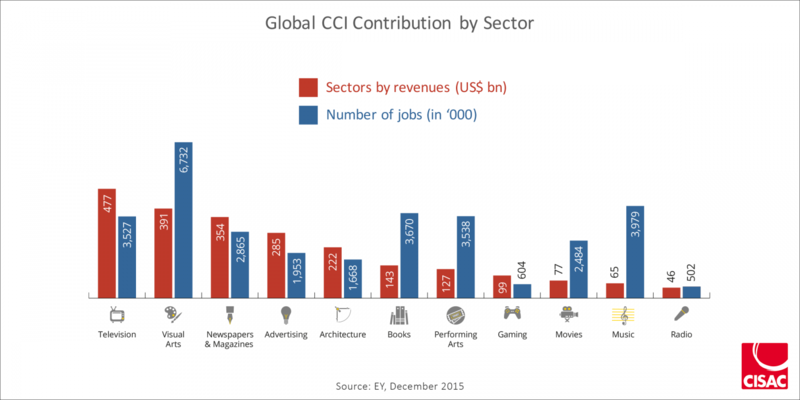 The study analyses 11 cultural and creative industry sectors. They are: advertising, architecture, books and newspapers/magazines, gaming and movies, and music, performing arts, radio, television and visual arts. Cultural Times assesses the contribution of cultural and creative industries to economic growth. It estimates that they generate US$250 billion in revenue a year, creating 29.5 million jobs worldwide. The report helps demonstrate the value of arts and culture. It provides a good rationale for government support of arts and culture, especially in developing countries where there are so many other demands on the public purse. South Africa is increasingly beginning to focus on cultural and creative industries as potential contributors to economic growth and job creation. This is reflected in the report, Mzansi’s Golden Economy, which sets out ways in which the arts, culture and heritage sectors can contribute to the growth and development of South Africa’s economy. In addition, the government recently established the National Cultural Observatory. It will act as a hub for information and research about the economic and social impact of the creative and cultural industries. South Africa did its first cultural and creative industries mapping study in 2014. Though not yet publicly available, it showed that the industries had created between 162,809 and 192,410 jobs, about 1.08% to 1.28% of employment in the country, and that they contribute 2.9% to GDP. Based on interviews with a wide variety of more than 2000 people involved in the cultural and creative sector, the study also found that firms tend to be small, with more than a quarter (27%) having only one employee, and a further third (34%) employing between two and five people. Women and men were about equal in proportion. More than three-quarters (77%) were from black, coloured or Indian race groups. Given the very severe youth unemployment in South Africa, the industries may be particularly important for job creation: 22% of employees are younger than 18, 18% between 19 and 24, and 19% between 25 and 30. This means that 60% of the workforce in the industries in is younger than 34. These findings echo worldwide trends. The global mapping study found that employment in the industries was relatively open to people from all ages and backgrounds (but especially the young), and dominated by small firms. In developing countries, production is dominated by the informal economy. The industries are also a potentially important contributor to social cohesion and nation-building through the promotion of intercultural dialogue, understanding and collaboration. This is strongly emphasised in the Department of Arts and Culture’s most recent strategic plan (not yet available online). These are part of a range of spin-offs that artistic production can offer, beyond the straight “instrumental value” – those values that, while undeniably important, are essentially spin-offs of the main point of artistic production. The “intrinsic” values and aims of culture, “art for art’s sake”, are things like: to entertain, to delight, to challenge, to give meaning, to interpret, to raise awareness, and to stimulate. These non-market values are difficult to measure in monetary terms, but are just as important as the instrumental values. While jobs can be created by many economic activities, what other kinds of production can generate these same intrinsic values? Cultural capital is one. This is defined as the sum total of a country’s wealth or stock of art, heritage and other kind of cultural expression. Like other kinds of capital it needs to be invested in – otherwise it will depreciate and be devalued over time. Public and private sponsorship and support of the arts is particularly important for those producers whose main focus is intrinsic value. Such cultural production is often challenging or disturbing and, while it has a big impact on collective thinking, may not be a financial or market success or may be distributed for free. Think, for example, of the role played by music in the fight against apartheid. While recognising and supporting the very important role that the cultural and creative industries play in the economy, I would argue that we shouldn’t lose sight of the unique intrinsic values that they generate. This includes the reflection and shaping of national and individual identities. Author: Jen Snowball is a Professor of Economics at Rhodes University.